Visit the most beautiful bay in the South of France, pick up point in chic resort of Ste Maxime, followed by a 10 minute crossing to St Tropez, then discover the Provencal Venice: Port Grimaud. We share with you anecdotes and history of the area. Seeing a resort from a boat, ensures you have an unfettered view of the town and surrounding coastline. Boat crossing is the fastest way to reach the different points on the bay. The mission of Smartfinder Home is to help real estate investors and buyers search the property market and receive independent advice. The story behind Smartfinder Home is in our blog. Many travellers to Cannes miss the opportunity to discover the Riviera as it was, before the construction craze that transformed the Alpes Maritimes on the East side of Riviera into a sprawling urban area. The Var is relatively unspoilt, and due to its preserved areas like the Maure hills, large inland areas, it offers tranquility of Provence countryside, as well as lively Mediterranean resorts. Sainte Maxime is the closest town to Cannes located on the famous Gulf of St Tropez. 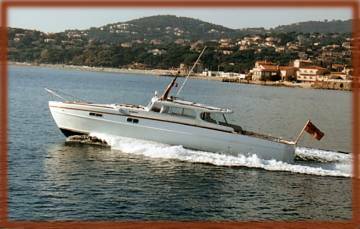 The classic 12M motor boat, Kyanos, is located in small old harbour in the town centre - details will be provided with the booking and a shuttle will be organized from Cannes to Ste Maxime. Temperatures in May are between 18 and 22C. The gulf of St Tropez is relatively sheltered from the wind. Wine from local wine domains will be served on board. We will respond to your booking request within the day you send us your request.